A few weeks ago we had Friday night dinner at a new-ish pub around the corner from our house, since AJ wanted a Friday night fish fry and the brewery with the famous fish fry across the river was just a little too busy for our plans (90 min. wait, yikes! ), the English pub we went to was a perfect compromise. When we ordered drinks, I stuck with my favorite (Grapefruit Radler) and AJ ordered something called a Black Banana. After I was all ‘Wait WHAT did you order? !’ and he told me it was Guinness and Banana Bread beer, all I could think about was making a stout banana bread, stat. 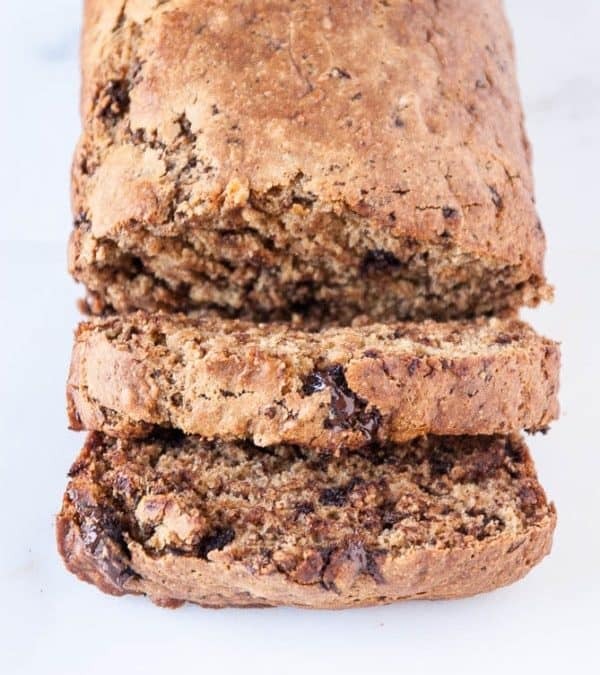 I actually made two rounds of this bread, first opting for a loaf without chocolate, heavy on the beer flavor and the next loaf (this one), lighter on the stout and heavy on the chocolate. AJ thought this one had a little too much going on in it and preferred the first batch, but when we had friends over for a cookout over the weekend, the chocolate studded batch was met with nods of agreement and approval, so both were winners. 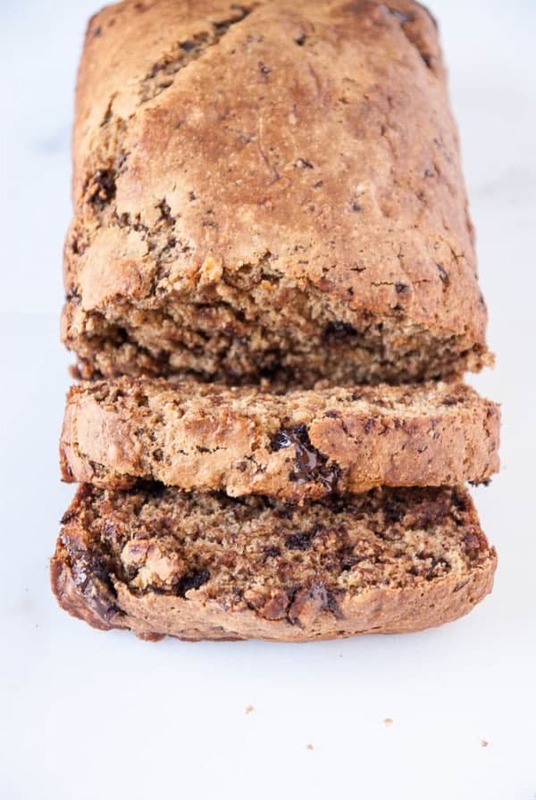 I used Guinness Extra Stout for my banana bread, (from what I’ve read it’s vegan), but use your favorite stout beer here, depending on your preference. I can also vouch that frozen/thawed bananas work perfectly fine in this, because that’s what I did for both batches and they turned out great. 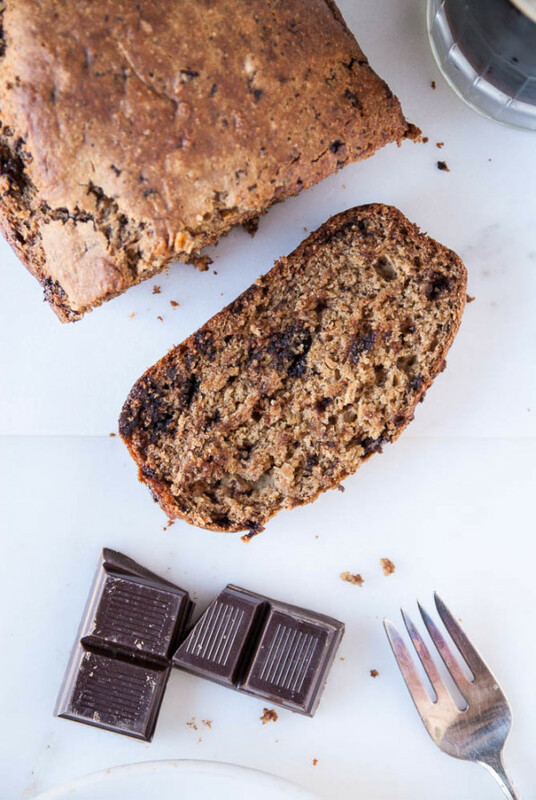 Between the crunchy edges and top, melted chocolate, and sweet roasted bananas, thick slices are not optional. I think this would make amazing french toast, especially if you plop a dollop of coconut whipped cream on there and call it a perfect brunch. If you make that, will you invite me over please? I’l bring mimosa fixings and solid Pandora station recommendations (Bruno Mars and Earth, Wind, & Fire are my current favs). Happy Wednesday friends! 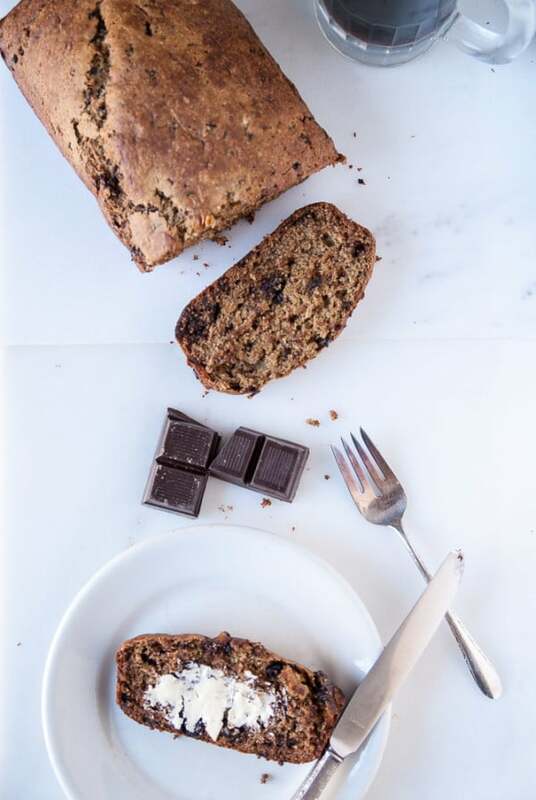 Vegan banana bread gets a boozy spin and studded with dark chocolate! Preheat oven to 350 degrees F. Grease a loaf pan and set aside. In a large bowl, beat together the bananas and brown sugar. When mixture is smooth, beat on low and add the beer, apple cider vinegar, almond milk, and vanilla. Add in the flour, baking powder, baking soda, salt and dark chocolate. Only beat until no flour streaks remain, try not to over beat the batter. Pour the batter into the prepared loaf pan. Bake for 45-50 minutes, or until the top is browned and a knife inserted into the center comes out clean. I’ll take the heavy chocolate stout too! And made into French toast?! Now were talking! Thank you for this, Abby! Thank you Traci! I’ll share a plate of this with you anytime! I think I just found my brunch for this weekend. Dark Chocolate Stout Banana Bread French Toast baby! I can’t tell you how much I love this stout in banana bread combo right now. I still haven’t baked with it yet, but I can’t wait to try! Yes, you have to Lisa! yes yes yes!! I never even knew banana bread beer existed, but then my life was changed! Worth mentioning, though, that not all Guinness is vegan – yet. Diageo just announced last week that they’ll stop using isinglass i.e. fish bladders for filtering in all of their beers as of 2016. 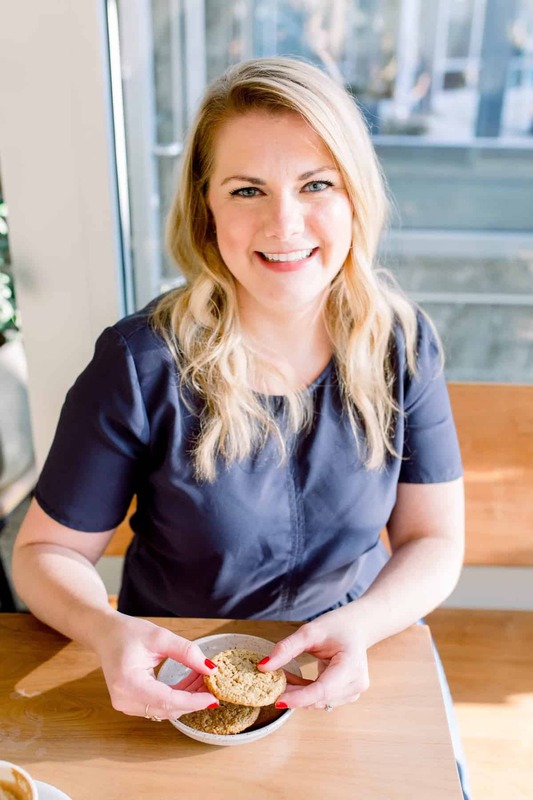 For now, stick to just the Guinness Extra Stout that is brewed in Canada, which is vegan-friendly, or choose another stout. 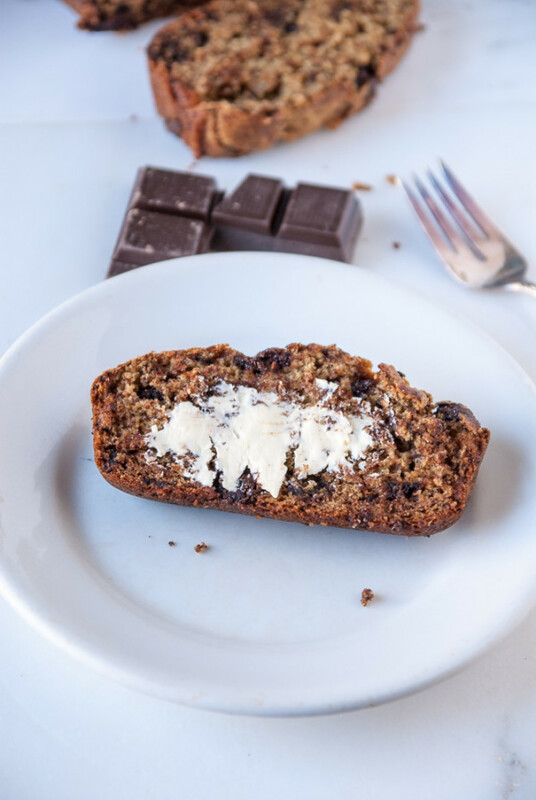 Always glad for new ways to enhance banana bread – thanks for the inspiration! This looks AMAZING. 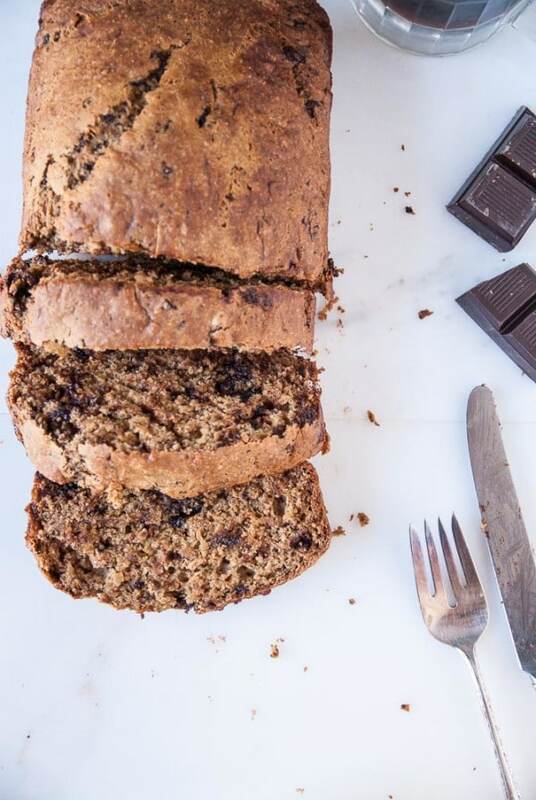 I’m a huge fan of beer in bread — never tried it with banana bread, though! Can’t wait. Being out of chocolate — what do you think it would be like with cocoa powder? I would guess 1/4 – 1/3 of a cup? And would I add in a bit more brown sugar? I would say 1/4 cup would be perfect! You can certainly increase the sugar, but I would also say increase the liquid by just a splash as well 🙂 Enjoy! Great! Thanks! Might add another banana for the increased moisture and flavor bonus 🙂 Can’t wait to try this!